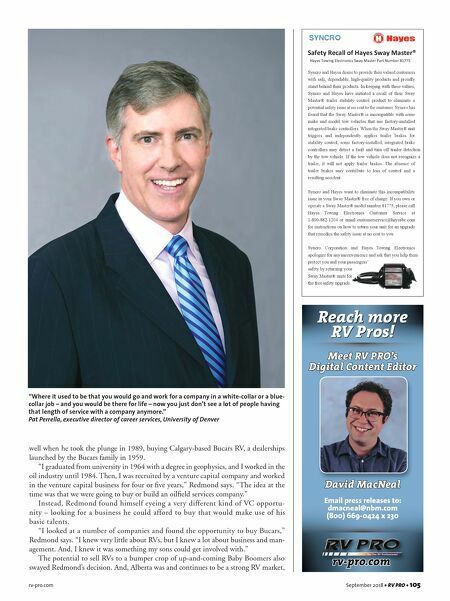 104 • RV PRO • September 2018 rv-pro.com D E A L E R S A Lifelong Learner For O'Brien, the challenges associated with learning a new business and solving problems were part of the allure of getting into the RV business. "I immediately set out learning the industry and learning about the products," he says. O'Brien gravitated toward Spader Management Group, a business that offers one-on-one coaching and consulting, peer 20 Groups, management training and efficiency tools, as a resource for leading for his family-owned dealership. Today, with 12 employees and a 3-acre property, he and his wife work hard to economize their space and adapt their product mix for the local market, now focusing primarily on towable units. "We've thought about expanding and relocating, but it's kind of like a restaurant. We know we can't carry that kind of volume," O'Brien says. "We've decided to maximize what we can out of our existing space without losing our relationship with our customers." Having managed a $20 million budget and hundreds of employees during his law enforcement career, O'Brien felt undaunted by numbers or the mechanics of running a busi- ness. The challenge for him became immersing himself in the industry. "I still remember the very first show that I worked in," O'Brien says. "People were coming up to me with the assump- tion I knew what I was talking about, and I was still learning the difference between a fold-up and a travel trailer." A Good Investment Bill Redmond also didn't know the RV industry particularly Brian Bent grew up working in his family's recreational boat business. Still, after graduating from college he went to work for accounting firm powerhouse Arthur Andersen and later served as a comptroller for some small companies. 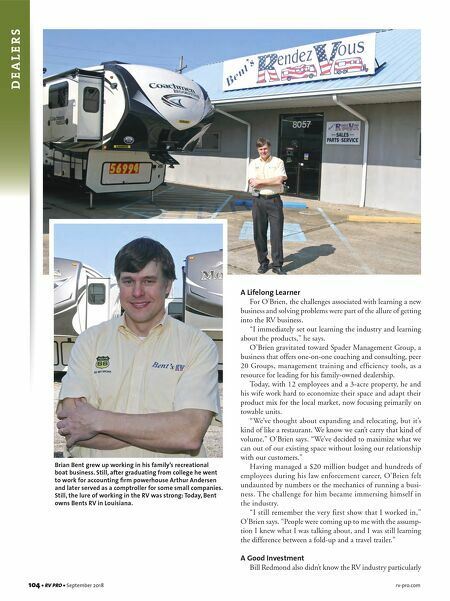 Still, the lure of working in the RV was strong: Today, Bent owns Bents RV in Louisiana.